One of the keys to financial success is monthly financial planning, working out a monthly budget plan (spending plan) to guide our steps forward. Clearly an ongoing, regularly scheduled, monthly planning session can be one of the most helpful components of anyone’s money plan. Here are some tips. There is nothing sacred about this being done exactly on the first of every month, or even on an exact monthly basis. But for most people I think the advantage of using the calendar in this manner is a distinct benefit. Most banks and financial organizations send out statements on a monthly basis. Many people are also paid on a monthly system. Most of the scheduling in all of our activities are organized around the calendar so it only makes sense to do our financial planning that way. For this reason, I recommend that a financial planning session be scheduled right after the beginning of each month when up to date information is most often readily available. Each person needs to decide exactly when and how often to do their planning based on their own circumstances but I think this is usually the most convenient and productive. When and where you work on your money plan is also important. The particular hour is not, but it needs to be a time when the conditions will be right. In the real world, under pressure my reading speed, my organizational thinking, my writing prowess, and even my typing skills multiplied! Not that it was a good thing and I did not do it all the time, but I cranked out quite a few major papers in a day or two when circumstances demanded it. Financial planning and decision making are not enhanced by the pressure of time or urgency. But financial planning and decision making are not enhanced by the pressure of time or urgency. The result of hasty financial decisions are not just bad, they can be disastrous. Pick a time and place when you can be relaxed and reflective. There are many reasons for keeping your records up to date. Just keeping out of trouble is one! I am amazed when I hear the charges banks and financial institutions assess these days for late payments and overdrafts. Keep yourself away from such charges by staying on top of your own accounts. But the main point here is that you need to keep up with your basic records like your bank accounts, ongoing expenses, debt obligations, and investment growth. You need this information in order to measure your progress toward personal goals and plan for the future. Prepare for your planning session by balancing your checkbook, figuring up your net worth, and gathering all other information you will need for the planning time. For example, if you are still working on eliminating your credit card debts you need to keep a list of these debts and compile them in a form that will enable you to compare them on a month to month basis. Know more to do more. Nothing will help you to keep moving ahead more than learning something new about financial success on a consistent basis. Knowing this, I have taken several steps to make the Success With Money site more helpful to you in this area. There are ten basic laws of money. But in my discussion of them I divided two that cover lots of material into two articles. There are several reasons, one just to keep those articles from being too long, but a major one is to make it easy to have one article for each month in an annual study of these principles. By reviewing each of the financial laws once a year, month by month, you will multiply your effectiveness with money over and over. Especially as one begins their financial journey toward success, it is useful to study all of these laws. But it is impossible to learn all that needs to be learned in a short time. Only as we apply them over time will we develop a full understanding of how they work out in real life. By reviewing each of the financial laws once a year, month by month, you will multiply your effectiveness with money over and over. Reading the Success With Money Action Newsletter is a great way to keep learning. The focus article directly or indirectly covers all the essential laws over a year’s time. There are also action steps regularly in all four learning areas, knowledge, understanding, skills and attitudes. It is vital to keep moving ahead. One of the greatest dangers to all of us is that we settle into a comfort zone, feel generally satisfied where we are, and stop making progress. When that happens it is likely only a matter of time before we begin slipping backwards. Some goals are remedial. We must stop over spending. We want to get rid of debt. We need to eliminate all negative influences on our financial thinking and practices. Often at the beginning these are the most prominent steps needed. But it is extremely important to have positive goals and plans. We feel relief when we escape a negative. But we generate real enthusiasm and drive when we see ourselves achieving positive goals. It is essential that in addition to having clear goals we have specific plans for their achievement. It is essential then that in addition to having clear goals we have specific plans for their achievement. If you are not in the habit of making specific plans or have not studied goal setting and planning skills, be sure to spend some time learning how to do this effectively. 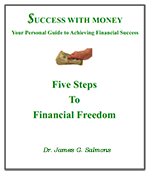 There are many excellent resources available including some good articles on Success With Money. Even if your new action steps are old ones for the most part, update them with current data. If you do this every month you will soon develop a sense of progress that will reinforce your commitment to your work and help build real enthusiasm for financial achievement. One of the great truths I have learned about success in general, and it certainly applies to financial planning, is the value of written plans. It has been shown that people who put their plans into written form outperform those who don’t by as much as a hundred times! An amazing fact. One student of personal achievement I know makes a strong emphasis on this point. I listened in awe one day as he told about his personal planning which culminated in a whole bookshelf of three ring binders containing specific plans for each area of his life. My first thought was that if I spent that much time planning I wouldn’t have time left to do anything! But I couldn’t argue with his success. He excelled in every area. And financially, at the time, he was earning over five million a year! Now I am not about to promise that kind of results to everyone. But I do know this. I have used written plans enough to prove their value. If you take time to write out your goals and then write out as clearly and exactly as possible just how you are going to achieve those goals, you will soon amaze yourself with the extent of your increased achievements. Clearly there are very few things a person can do to guarantee their financial success more than to set aside a little time each month to review their progress, think over their options and make specific plans for the days ahead. If you haven’t done so already, take time now to decide when and where you will start this practice in your own life. Then make a firm commitment to let nothing stand in your way from making monthly financial planning a permanent part of your life. And one additional point. If you have a family to consider, take them into account. Those with spouses, especially, would do well to include a joint effort in this area. Take into consideration any other personal relationships, as well. But whatever else you do, be sure to make monthly planning a consistent part of your financial life.